After the installation of Fedora 22 cheese and all applications that use the webcam only deliver video in black and white. I wonder if there is a software (other than cheese because it does not have the option) to bring back color saturation in video camera streaming. If that is possible. Or solve the problem of only black and white picture. Previous versions of Fedora supported my webcam properly and my webcam is capable of a good color picture. I managed to solve the problem in Ubuntu using a software called Video4Linux Control Panel. Is this program available for Fedora too? I managed to solve the problem in Ubuntu using a software called Video4Linux Control Panel. Is this program available for Fedora too? 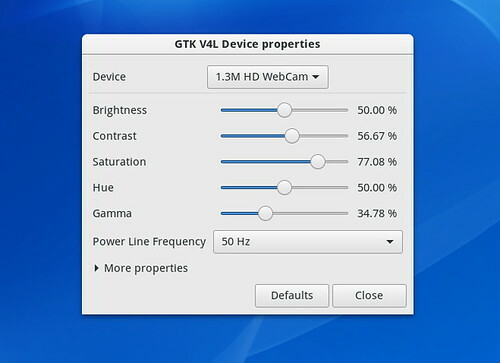 gtk-v4l is the package you want. What cam applications can I obtain for my Toshiba notebook? How do I develop an app that makes use of my webcam: Logitech 400?